The most anticipated game ever, some say, Fallout 4 has been out a few weeks now and now that most of us have had a few weeks to play through it and maybe remember to try and beat it we can have a discussion on the game. Where we can talk about Spoilers freely and without a 140 character limit! So here are my thoughts on the game and feel free to respond to them or post your own. I really have enjoyed the game a lot so far. I have spent a lot of time exploring the world and enjoying all the lore bits you get from terminals and holotapes and what not. That is always one of the best parts of Fallout games and they didn’t skimp there. The Commonwealth Wasteland is an interesting and fun place in many regards. The atmosphere is perfect. All that being said, I hated the story. I didn’t at first but once I got to the point where I had to choose between being hated by the Institute or being hated by the Railroad by going to Mass Fusion with one or the other it just all went down hill for me. Overall it felt less like Bethesda didn’t want you to make it your story. It is their story they are telling and you are just along for the ride. This was best exemplified by the opening and ending videos I think. No longer was the opening video generic setting up the background to the events. Now it is about the male protagonist (which I hated since it felt like unlike other games it made female character second fiddle) and his experiences that are part of the theme to the game. Your characters are now established by the game to be certain ways no matter how antithetical that is to how you play the game. The ending after you beat the game is no longer a series of slides showing how your actions and choices have changed the Wasteland, which I always loved about Fallout games as it made me feel like I had actually made a difference. Fallout 2 had 47 ending slides to reflect the wide variety of choices you make. Fallout 3 had far less but they Fallout 4 instead you get a mostly generic monologue by your character about how they learned that they can’t go back and they learned a lesson from the journey. That isn’t to say the game doesn’t give you choices. You can choose between four different factions for the end game. Those choices just felt a bit meaningless and you get to do little choices to make within those factions. One of the biggest choices I felt they removed was the “Talk the enemy to death” option that Fallout was famous for. There are no peaceful options out of many of these quests. The best we get with the Big Bad Father is convincing him to give us a code to turn off a few of the Synths to make the final push a little easier. A few of my thoughts on the endings. The Railroad Ending: My biggest issue with this ending is similar to some other endings. Why do we have to blow everything up? Wouldn’t some of that be, I dunno, useful? We are going in and killing everyone anyways. Nice way to maybe spice up this ending is have you need to choose how to free the Synths after winning. Should brain wipes be stopped and if so what would outcome be? Should you try to free earlier Gen Synths? Would that do any good? The Brotherhood Ending: Okay Liberty Prime was cool in 3 but do we really need a rehash of that as the ending? It didn’t even seem as epic as the push on the Jefferson memorial in 3, other then Liberty vs a Super Mutant Behemoth. Maybe have Liberty Prime as one of their side quests not the big finish. I liked the Danse choice alright but would have been nice if that had been expanded on more and not just a way for you to keep Danse as a follower if you did the BoS ending. The Minutemen Ending: Okay this was the last ending I did so at that point I was pretty tired of fight your way into Institute, tech person of faction sends you to Father, fight your way to reactor to blow it up. I guess that was fine to have for three of the endings, maybe it is less dull if you aren’t doing it all in one day like me. 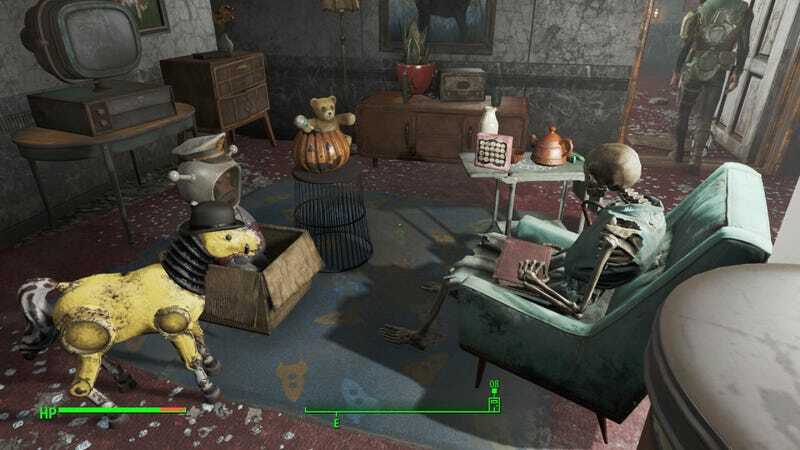 Still there was so much wasted potential with the Minutemen since they don’t get much to do other then clearing out the Castle, defending the Castle, and sending you to go help settlements. Their end quest line could have been you trying to forge a new Commonwealth government! That would have been amazingly interesting and extremely relevant! Through speech or violence or by doing things to help them, you convince the various settlements of the Commonwealth to join your cause. Perhaps give you chance to decide the fates of non-humans in the new country. That would give a good tie in to interactions with BoS and the Railroad. The Institute Ending: The Institute ending felt weak because as far as I can tell their plan is. C) The Future is in their hands! Underground! Doing science I guess? They probably could have used a better step two once they took out the Railroad and BoS and were no longer constrained by power needs. Move to surface and rule overtly? Do some super wacky super science? I dunno, something. There were some different elements in the Institute like a scientist in Robotics who was pro-Synth and the guy in SRB who was more authoritarian. Would have been nice if you could have done something with those factions to take the Institute in different directions if you want to. There are some great quests the game like Cabot House and the USS Constitution and they do give you some freedom of choice as to the outcomes. But unfortunately for such a big open world, there aren’t many of them and you can get through them pretty quickly. All this boils down to is as an open world RPG I expect more freedom of choice. To feel like I have an individual impact on the game that could make it a little different from others choices. I was excited for Fallout 4 because I thought with the time they had to improve the game from Fallout 3, Bethesda would give us a game much freer to play as you like. Instead it seems they moved away from that. Now I am hopeful for another Obsidian made Fallout game that can take the game improvements of Fallout 4 and give us a game closer to what I wanted.